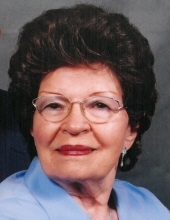 Esther Kebschull, 94, of Oconto went home to be with her Jesus and Savior on Thursday February 7, 2019. Esther was born to the late William and Martha (Jevorutsky) Pusich on March 11, 1924 at Oconto Falls. She married Ervin Kebschull on November 15, 1941 in Suring. Several years after their marriage they moved to Illinois where they raised their family. The couple returned to Wisconsin upon retiring in December of 1979. Ervin preceded Esther in death February 19, 2009. Esther enjoyed shopping, gardening, flowers and spending time with her family. She was a member of Hillside Assembly of God Church, Gillett. Surviving are one son Gary Kebschull, Suring; two daughters, Nancy (Kenneth) Gordon and Patty (Edward) Quandt both of Oconto Falls; five grandchildren, Daryn Pruett, Tennessee; Cary (Kim) Pruett, Tennessee; Todd Leisner, Green Bay; Tracy (Ruben) Mamann, Los Angeles; Blake (Kim) Leisner, Pound; many great grandchildren, one brother Kenneth (Theresa) Pusich, Suring, three sisters, Carol (John) Kanz, Crivitz; Margie Rakowski, Pound; and Jeanne Leisner, Milwaukee. Besides her parents and husband she was preceded in death by an infant daughter Judith Ann, a daughter-in-law Nancy Kebschull, three brothers, Chester, Edward and Harry Pusich, three sisters, Stella Sprout, Emma Jashinsky and Olga Kopatz. The family will greet relatives and friends Saturday, Feb. 16, 2019 at Hillside Assembly of God Church, Gillett from 9:30 AM until the time of the Funeral Service at 11:30 AM with Pastor Paul Carlson officiating. Esther will be placed to rest at Breed Union Cemetery. Please visit RhodesCharapata.com to express online condolences. The family would like to especially thank her caregivers, Joan Hubacker and the staff at Care Partners for being like family to her as well as Unity Hospice. To send flowers or a remembrance gift to the family of Esther Kebschull, please visit our Tribute Store. "Email Address" would like to share the life celebration of Esther Kebschull. Click on the "link" to go to share a favorite memory or leave a condolence message for the family.